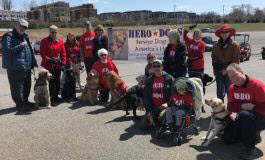 Hero Dogs relies on volunteers to fill a variety of roles in the organization. We seek those who share our passion for serving those who have served. A volunteer application must be submitted before you can volunteer. Volunteer applications are to be submitted by and for adults only (see our policy on youth volunteers below). All potential volunteers should attend our Introduction to Hero Dogs presentation. This presentation is for anyone who is interested in learning more about Hero Dogs, whether as a potential applicant, volunteer, donor, or other supporter. See the event list for the next session. PLEASE NOTE: the nature of our program does not provide volunteer opportunities to simply play with the dogs. Volunteers who interact directly with the dogs are puppy raisers, puppy sitters, and kennel volunteers. Veterans, first-responders, and persons with disabilities who have any of these skills are particularly encouraged to apply. If you are interested in serving on our Board of Directors, please fill out a volunteer application and our volunteer coordinator will send you additional information. The Application Committee determines eligibility of applicants for the Hero Dogs Program, reviews applications received, and makes a recommendation for acceptance or denial to the Program Director. Read the detailed information on the puppy raiser page. Fill out a separate puppy raiser/puppy sitter application (a link will be sent to you after you fill out the volunteer application). Attend a puppy program orientation session (see the event list for the next scheduled orientation). Read the puppy raiser manual (a link will be sent to you after you attend orientation). Complete a home visit (will be scheduled after you attend orientation). Attend two hands-on dog handling training classes (will be scheduled after your home visit). Agree to abide by all of the rules for and responsibilities of puppy raisers. Volunteer as a puppy sitter at least once. Puppy sitters are volunteers who cannot commit to full-time puppy raising, but are willing to take on the role of puppy raisers when a puppy needs temporary care (for example, when a puppy raiser has travel or another commitment to which they cannot bring their puppy in training). Puppy sitters must live within ~45 minutes of our facility. To become a puppy sitter, you must complete all of the same requirements as puppy raisers listed above. fill out “report card” on puppy’s visit and return to raiser when puppy is picked up. Attend a kennel volunteer orientation session (see the event list for the next scheduled orientation). Read the kennel volunteer manual (a link will be sent to you after you attend orientation). Shadow at least one morning shift and one afternoon shift with an experienced volunteer. Complete an observation shift with our kennel manager. Attend a new volunteer orientation session (see the event list for the next scheduled orientation). Before attending the orientation, you are welcome to attend an event along with other experienced volunteers. Please note that only staff, puppy raisers, and a handful of approved volunteers (some puppy sitters and board members) are actually approved to handle Hero Dogs at public and private events. there is only one child per parent. the child is middle-school aged or older. the child is earning SSL hours. the child is actually doing the work. After you complete the volunteer application, you will automatically receive our newsletter to keep you abreast of Hero Dogs news and opportunities. You can also reach us at volunteer@hero-dogs.org if you have any questions. Volunteers are not paid, but expenses incurred for volunteer service (e.g. mileage) may be tax deductible. Consult your tax adviser for details. 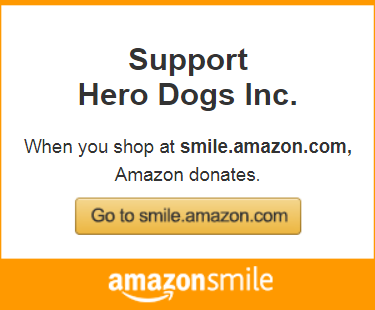 Hero Dogs, Inc. is recognized as an exempt organization under Section 501(c)(3) of the Internal Revenue Code.